Ken writes: A reporter from a large Illinois newspaper asked me if I thought the current caramel apple pie craze had anything to do with the resurgence of pie making in this country. I was clueless about the caramel apple pie craze, but I launched into a dazzling answer, as if I had been personally responsible for starting it. Then I hung up the phone and quickly started inventing my own recipe, basing it on one the reporter had recently tried and fallen in love with. So here is my version of caramel apple pie, which has a pecan crumb topping covered with a layer of caramel and pecans. It has great eye appeal—just like a caramel apple—and the pecan, apple and caramel flavors couldn’t be more delicious together. So have at it—and just remember, you read about it here first. From Pie by Ken Haedrich (The Harvard Common Press, 2004). Recipe © 2013 by Ken Haedrich and used by permission of The Harvard Common Press. Prepare the pastry according to Basic Flaky Pie Pastry recipe, using a total of 3 tablespoons sugar. Refrigerate until firm enough to roll, about 1 hour. On a sheet of lightly floured waxed paper, roll the pastry into a 13-inch circle with a floured rolling pin. Invert the pastry over a 9½-inch deep-dish pie pan, center, and peel off the paper. Tuck the pastry into the pan, without stretching it, and sculpt the edge into an upstanding ridge. 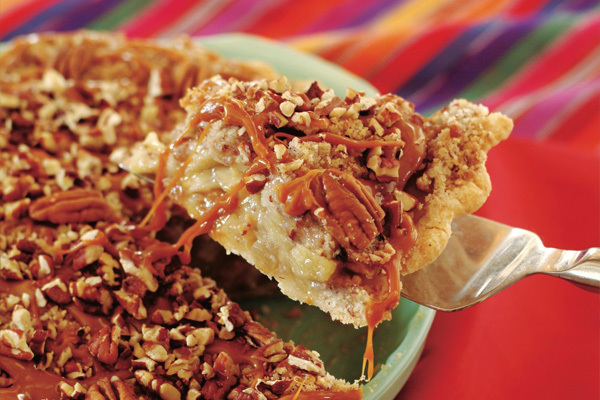 Scatter the caramel pieces in the pie shell and place in the freezer while you make the filling. Preheat the oven to 400°F. Combine the apples, brown sugar and lemon juice in a large bowl. Mix well, then set aside for 5 to 10 minutes to juice. Mix the granulated sugar and cornstarch together in a small bowl. Stir the mixture into the fruit along with the cinnamon and vanilla. Scrape the filling into the chilled pie shell, smoothing the fruit with your hands. Put the pie on the center oven rack and bake for 30 minutes. Meanwhile, make the crumb topping. Combine the flour, pecan halves, granulated sugar and salt in a food processor. Pulse several times, chopping the nuts coarsely. Scatter the butter over the dry mixture and pulse the machine again until the mixture resembles fine crumbs. Transfer the crumbs to a medium-size bowl and rub the mixture between your fingers to make damp, gravelly crumbs. Refrigerate until ready to use. Remove the pie from the oven and reduce the temperature to 375°F. Carefully dump the crumbs in the center of the pie, spreading them evenly over the surface with your hands. Tamp them down lightly. Return the pie to the oven, placing it so that the part that faced the back of the oven now faces forward. Just in case, slide a large aluminum foil–lined baking sheet onto the rack below to catch any drips. Bake until the juices bubble thickly around the edge, 30 to 40 minutes. If necessary, cover the pie with loosely tented aluminum foil for the last 15 minutes to keep the top from getting too dark. Transfer the pie to a wire rack and let cool for about 1 hour. While the pie is still warm—approaching the 1-hour mark—prepare the caramel. Combine the butter, water and caramels in the top of a double boiler. Melt the caramels over, not in, barely simmering water. This may take 10 minutes or more. To facilitate the melting, press down on them as they start to soften and melt. When melted, whisk the mixture until it is smooth, then drizzle the caramel over the entire surface of the pie. Immediately press the pecan halves into the caramel in a random fashion, then sprinkle the chopped pecans over the top as well. Let cool for another hour before serving.